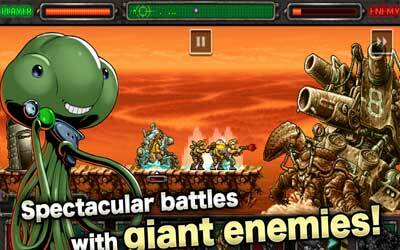 Metal Slug Defense 1.34.2 APK is available in my archive. The latest version gives you new areas, new missions, new units and new languages. This is about the items so it’s better to update it to get it all. This game has a 2D view, but there are many differences Game Play the fame on Android compared with PlayStation and PC versions. In android version we did not play as a character but as a strategist. We are given points which named the AP, these points we use to recruit soldiers in accordance with its value, and every soldier has the capability respectively. Collaboration Campaign with “THE BATTLE CATS” app until Nov. 4th, 2015! New Collaboration Event! Free all the POWs to get limited edition Units! “Gross Cat”, “Titan Cat”, “Teacher Bun Bun”, and other popular characters are available to purchase during a limited time! Some people may say that games with in app purchases are “pay to win” But if you know the units well enough, you can beat the game without having to spend any real money! And it’s also pretty easy to get medals too.